Travel agents can save you time and money. If you use the right one. Our staff is well-traveled, knowledgeable and ready to help you choose your next travel destination. Why are we so good at what we do? We love travel. We love TO travel. We love to hear about your travel. We love to help you plan your travel. We especially love hearing our clients say, "That was the best trip ever! The tips you gave us saved us so much trouble and made the trip so much more enjoyable." In short, that's what we do. We tell you what it was like when we personally flew into one London airport and had to transport to the other airport for the next flight. We can help you choose the best location to stay in Paris or the best hotel in Ulaanbaatar. How? At least one of us have been there! We like to say, "Been there done that". And the truth is - we'd do it all over again! Well, actually there are lessons we have learned that we do NOT want to repeat and we'll pass that on to you as well. We book all aspects of travel. Airline, Hotel, Rental Car, Cruises, Tours, Specialty Tours, Travel Insurance, domestic, international and we serve all of your travel needs. We specialize in leisure, groups and corporate. If you need a corporate agent that really gets to know you and your travel needs, one who books for you as an individual or cater to the entire company - we are the one to call. If you have 50 people all traveling from one place to many places - or from many places to one place - of from many places gto many places - we are the specialists! And we are not talking jack of all trades and master of none. We have all worked as a travel agent for over 20 years. We really are specialists. Our prices are often better than anything you can find after hours of research! Plus you get our expert advice and guidance. You might be ready to book your ticket to China - but did you know if you plan on traveling within China during your visit you should book it all together? When 3 am rolls around and you are rolling out of bed so you can get to the airport in time for your 6am flight - was it really worth that $20 savings? We'll remind you of things like that. Your choice of course - but at least you will make it with your eyes wide open and not think of it for the first time when you are setting your alarm to wake up the next morning. If you book through us, we are your advocate. Sometimes an advocate/personal travel agent is just what you need. Situation: You are at the airport. Flight JUST was cancelled and there is a line of 100 people at the airline counter. You have us so - go ahead get in line - but call us at the same time. We can often rebook you and get you out of that line and on your way faster - and isn't it all about time? We are not only surviving - we are thriving! We get calls from new clients wondering how we are still in business with the Internet travel sites, etc. The answer is fairly simple. We are very good at what we do and we are human beings working in an office in San Rafael, California. Our industry partners (airlines, cruise companies, etc) respect us and we have some great deals we can pass on to you. In fact, the price you pay for a cruise is often less when purchased directly from us or we can offer you perks that you might not otherwise be offered. Just give us a call! 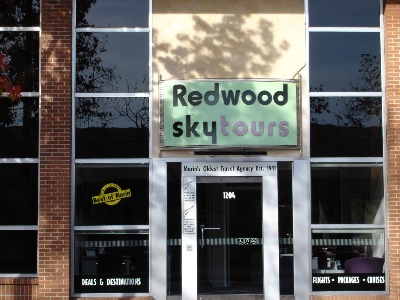 We are conveniently located in downtown San Rafael with free parking in the rear of our building. Our office hours are 9:00 am - 5:30 pm M - F. Appointments are helpful but not always necessary.